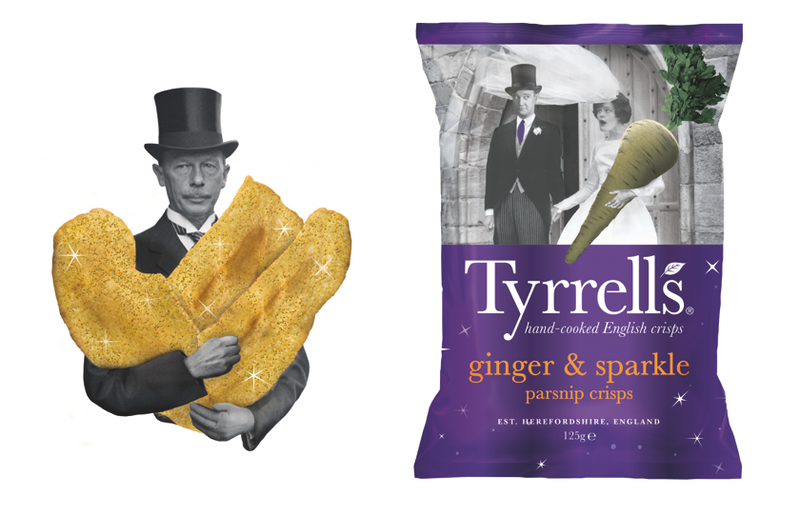 To celebrate the upcoming wedding of Prince Harry and Meghan Markle, premium hand-cooked English crisp brand Tyrrells has launched a new flavour of Veg Crisps: Ginger & Sparkle. The Parsnip Crisps are flavoured with a hint of ginger, sweet honey and added edible glitter, giving a celebratory feel for the royal wedding. Ginger & Sparkle Parsnip Crisps go on sale on 30th April in independent retailers at a RRP of £2.49. Tyrrells will also be running competitions on its Facebook page for fans to win packs and royal wedding party bundles. Tyrrells prides itself on creating unique and memorable flavours for its range and Ginger & Sparkle is in keeping with Tyrrells’ signature style and will sit alongside the rest of Tyrrells’ award-winning Veg Crisps range for the month of May 2018. Adam Draper, Marketing Director at Tyrrells Potato Crisps, said: “The royal wedding is a massive event for the British public this year and, as a quintessentially British brand, who prides itself of creating delicious but quirky products – we wanted to go above and beyond to mark the occasion. The Tyrrells Vegetable Crisp range is made with only the best quality veg. Once the veg arrives at Tyrrells, they are hand-cooked in small batches and then seasoned to perfection with only the finest, specially selected ingredients. The crisps boast a unique curl, Tyrrells’ signature crunch and superlative taste.